What could be more fun than crunching on chocolate covered pretzel rod "candles" in a candy coated rice crispy treat menorah for Hanukkah?! This 100% edible menorah is pretty simple to make and a really fun treat to eat with the family. It also makes a great gift or Holiday party centerpiece! You can also make mini versions using pretzel sicks and wrap them up for gift giving. Flatten batch of rice crispy treats into a large triangle about 2 inches thick. Use your pretzel rods as a guide to make sure you make your menorah thick enough and long enough across for 9 "candles". Cut four 90 degree angles ("L" shapes) on each side and cut off the point at the top, creating the menorah shape shown above. Push each pretzel rod into place and then remove, creating a hole for your pretzel candles to fit once coated in chocolate. Set aside while you make the candles. Melt bag of candy melts according to package for the candles. Holding one end, dip the pretzel rod in candy coating, letting excess chocolate drip back into bowl. You can also use different colored candy melts for an authentic Hanukkah candle look. (It is ok if they are not perfect, the extra chocolate will look like the melted wax from the candle!). Lay coated pretzels on wax paper and refrigerate until set and dry. Create 9 flames out of yellow gummy candy or fruit chews by molding a piece with your fingers or cutting it with scissors. Use your melted candy coating to attach each flame to the tops of each candle. Stand you menorah up on a wire cooling rack with a wax paper lined cookie sheet below the rack. Pour melted candy coating, in color of your choice, over menorah, using a knife or spatula to cover the entire surface. Immediately, stick your pretzel rod candles into each hole on your menorah. Place in refrigerator to set and dry. I used a candy mold for the letters and star, but you can alternatively pipe white chocolate free-hand onto wax paper, let dry, and attach to the front of your menorah! You can also skip the menorah and make the "8 Nights Of Hanukkah Chocolate Covered Pretzel Candles" to give as a special treat for kids to munch on each night! 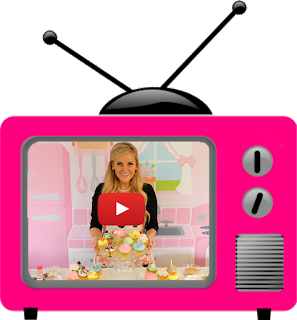 Click here to check out my entire Holiday roundup for more fun recipes & treats!